UPDATED JAN 20: 2:15pm: New WINTER STORM WATCH in effect from Friday 6am to Saturday noon. Summary: Warming up slightly today. Rain tomorrow. Rain change to snow on Friday. Let’s do this again. It’s an icy, snowy winter wonderland out there and schools are closed, but what do we have in store for the rest of today and into our next winter weather event? Today, we will be warming up to about 36 degrees under cloudy skies and calm winds. 36 degrees is above freezing and will help melt things a little bit. We don’t anticipate any additional precipitation throughout the day today. Tonight, temperatures drop to just below freezing at 30 degrees, refreezing anything that was melted before. Travel in some spots could be slick. A 20% chance of rain comes in after midnight. Thursday will be an improvement from today, with a high temperature of 40 degrees. We will see rain for most of the day with an 80% chance of seeing rain. This rain and the high temp of 40 should help melt away any ice and snow we received on Wednesday fairly quickly. 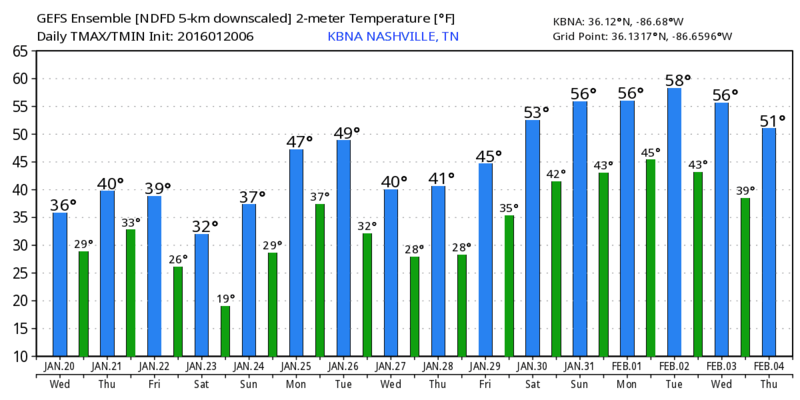 We expect to reach above freezing on Thursday morning by 9am. There could be a couple of rumbles of thunder with this rain moving through. 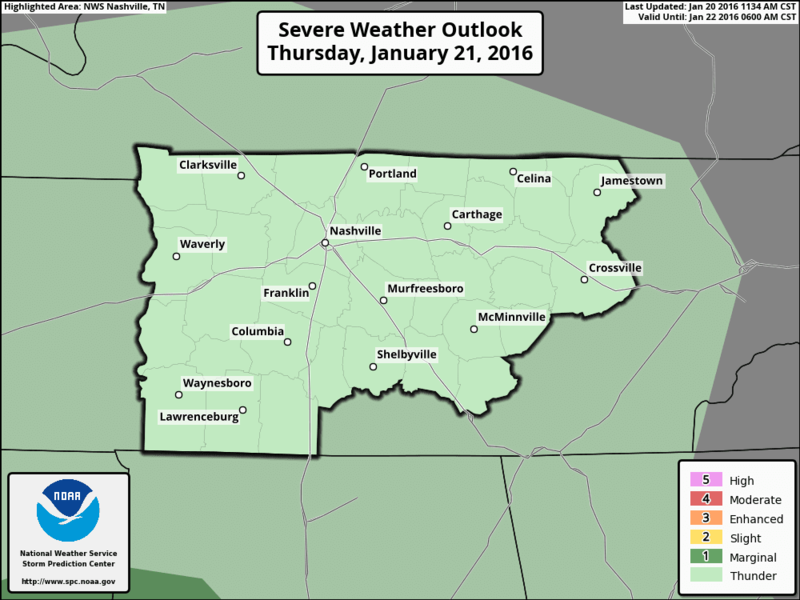 The Storm Prediction Center has outlooked us for Thunder for Thursday. 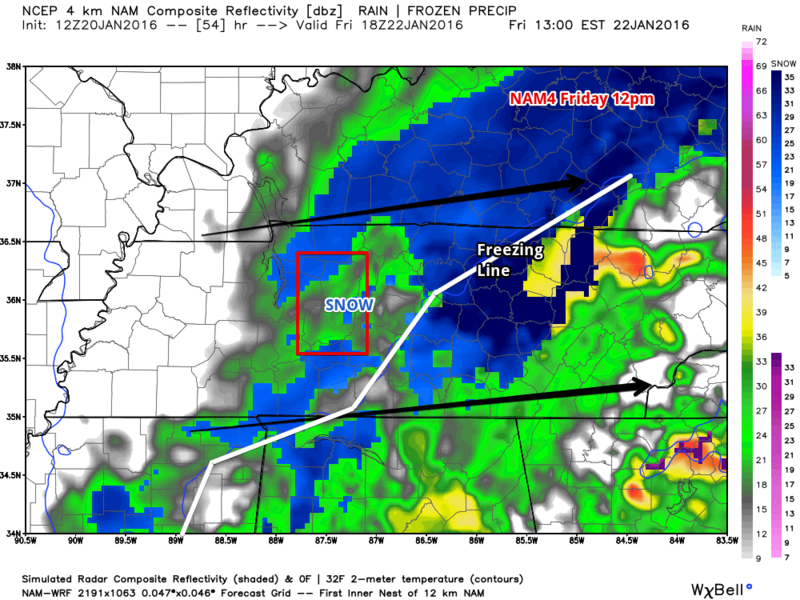 ANOTHER WINTER STORM WILL BRINGING RAIN TO MIDDLE TENNESSEE ON THURSDAY...WITH RAIN MIXING WITH AND CHANGING TO SNOW ON FRIDAY BEFORE ENDING FRIDAY NIGHT. A DUSTING TO A COUPLE OF INCHES OF SNOW APPEARS POSSIBLE ON FRIDAY...ALTHOUGH THE EXACT AMOUNTS OF SNOW REMAIN HIGHLY UNCERTAIN AT THIS TIME. Rain will likely start around 11am for most of us, with spotty showers. Here’s NAM4’s simulated radar at 11am. Rain starts to pick up around 2-3pm, becoming more frequent. 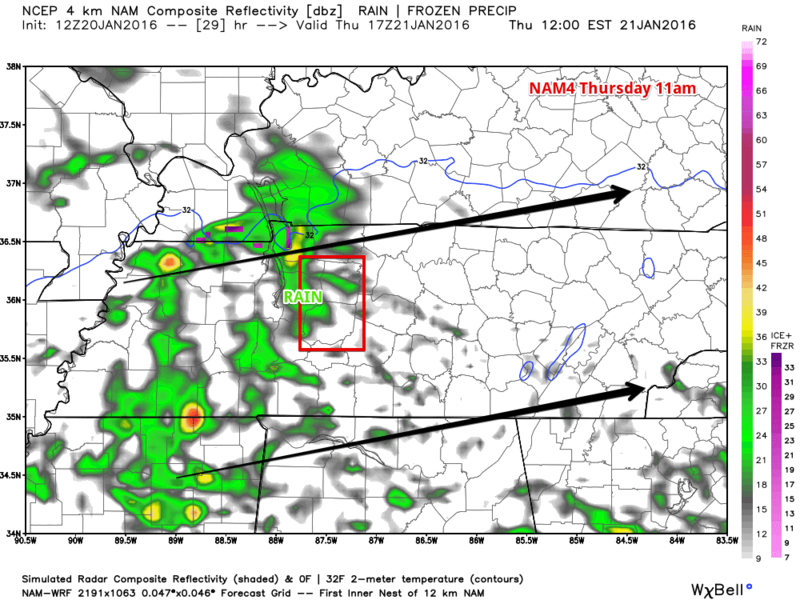 Here’s NAM4’s simulated radar for 3pm. Rain will continue after dark as well. Here’s NAM4’s simulated radar at 9pm. Rain chances increase to 90% overnight with our low temperature dropping to above-freezing 36 degrees. 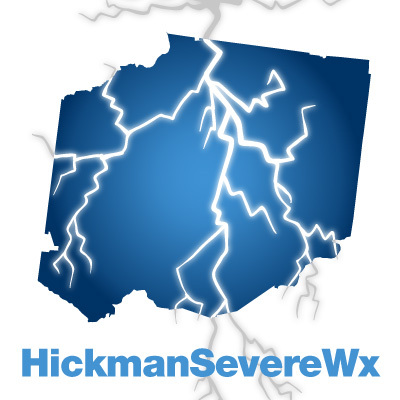 This will keep any overnight precipitation from becoming wintery precipitation. Friday is when things start to get interesting. We will start the day off with a 90% chance of rain, changing over to snow after 12pm. The forecasted high temperature is 37 degrees. Current forecasts put the freezing temps to return around 6pm. Winds will be 5-15mph coming out of the northeast then switching to come from the northwest as the day goes on. 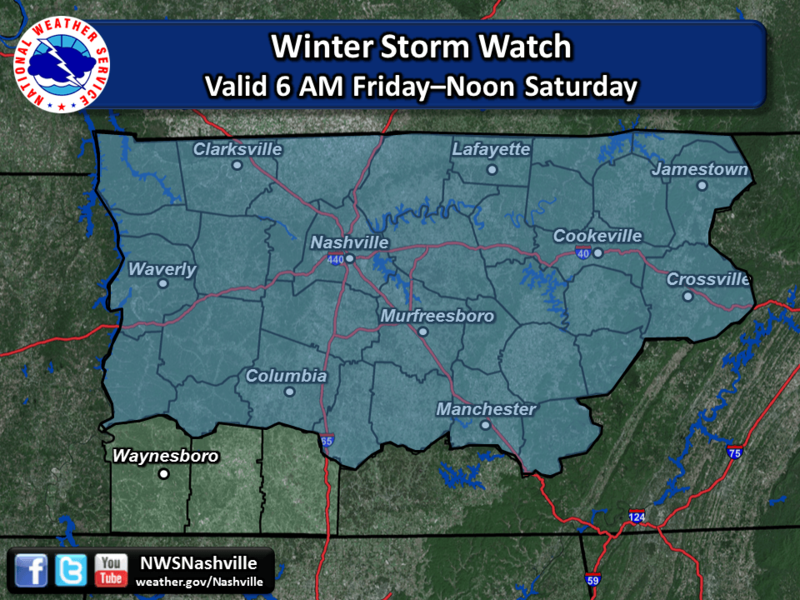 UPDATED JAN 20: 2:15pm – NWS has went ahead and issued a WINTER STORM WATCH starting Friday 6am through Saturday noon. WORD OF CAUTION: All of Friday’s snow forecast is subject to change and will likely change a couple of times before the event arrives. 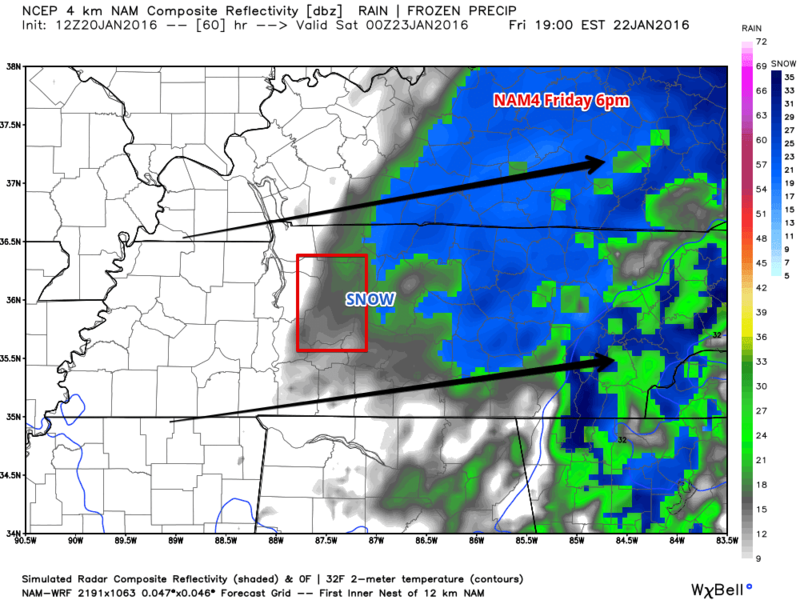 Currently, the NAM4 shows our changeover happening around 6am in the morning, but I think this is a little aggressive. Here’s NAM4’s simulated radar for 6am. The GFS is in agreement, saying we should see rain up until 6am in the morning. 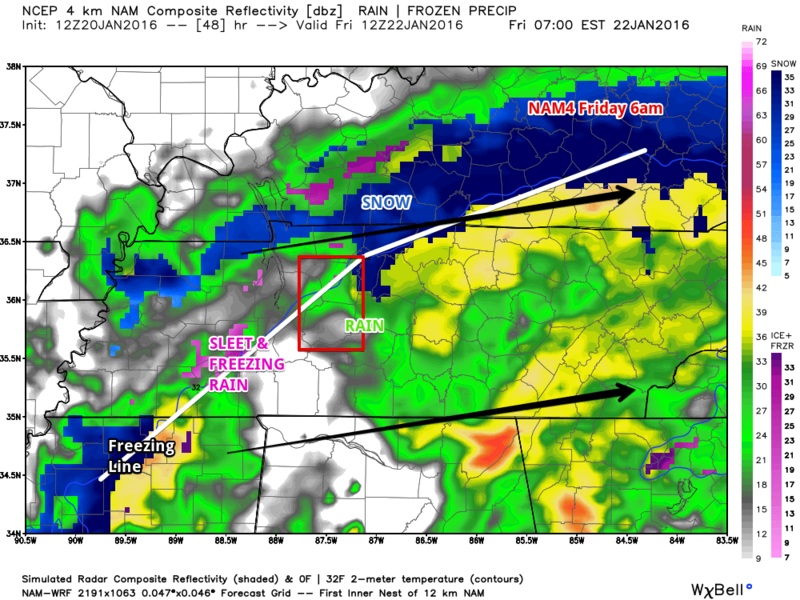 Here’s GFS’s Precipitation Type Forecast for between midnight and 6am. 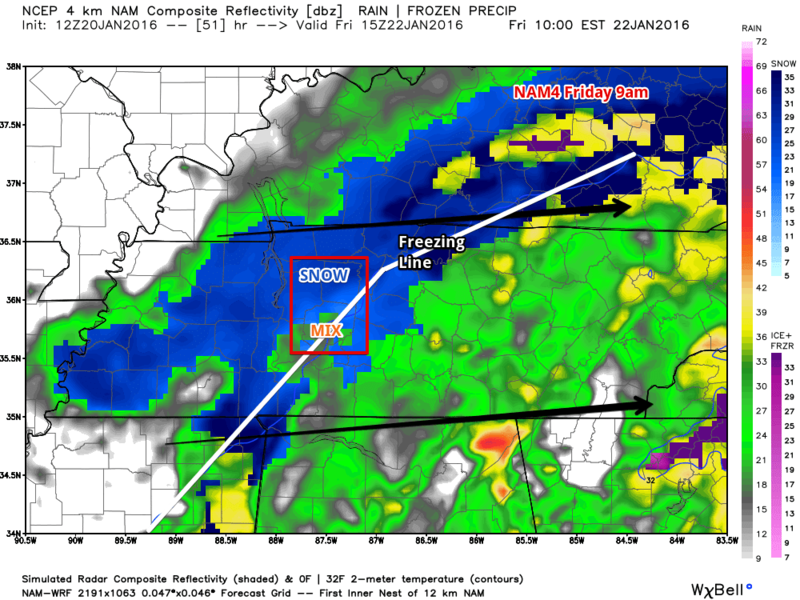 NAM4 is anticipating us seeing all snow around 10am. Here’s NAM4’s simulated radar for 9am. All snow is expected around lunch time Friday. 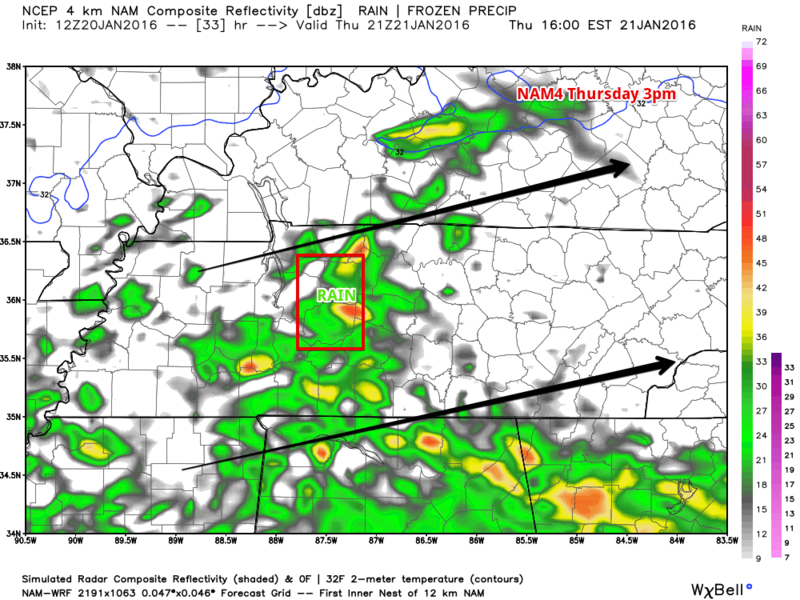 NAM4’s simulated radar for noon. 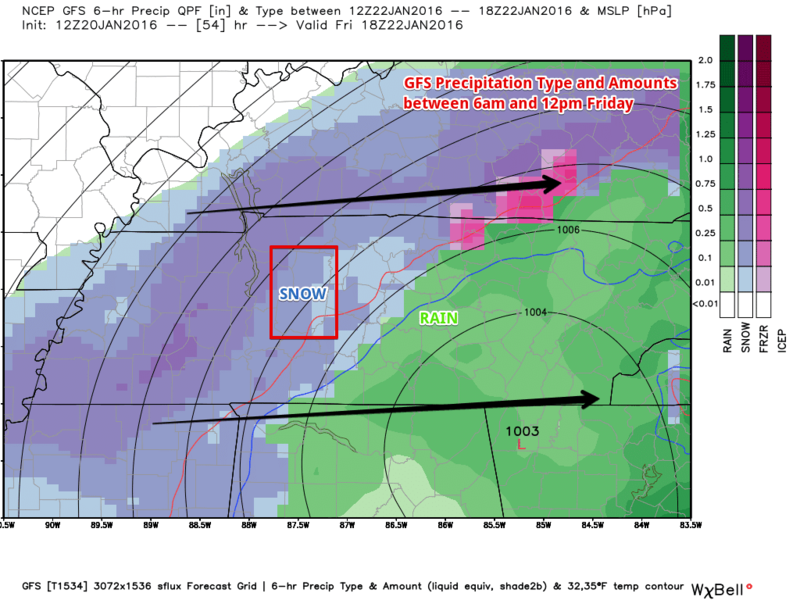 GFS model agrees, expecting all snow between 6am and noon. 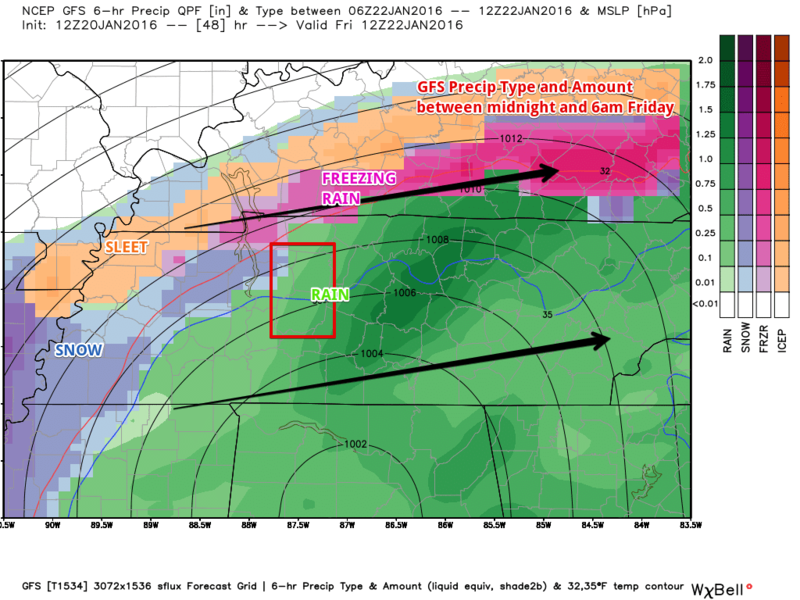 Here’s GFS’s Precipitation Type forecast. Snow will likely end in the evening hours. 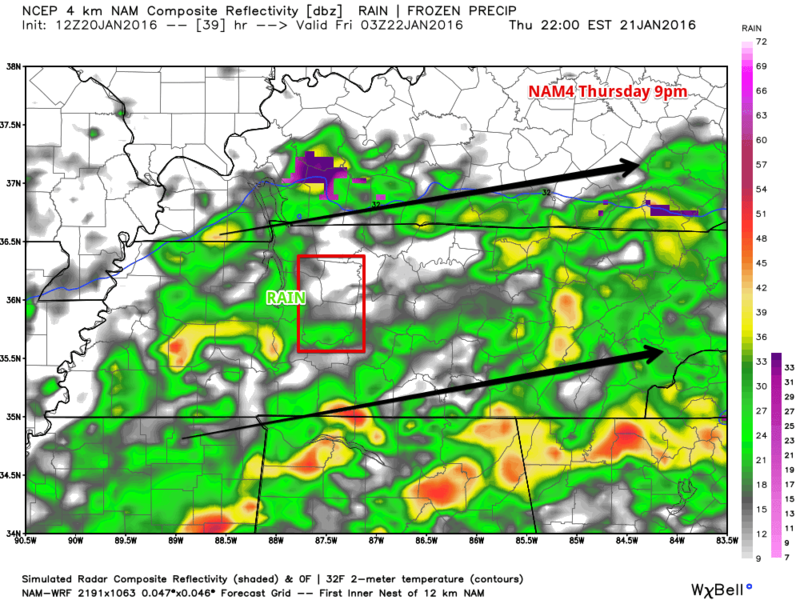 NAM4’s simulated radar for 6pm. 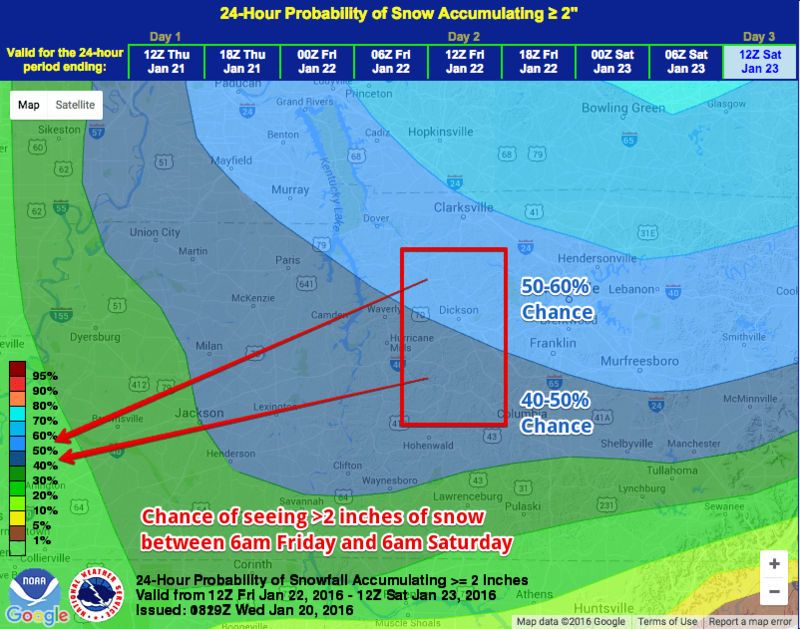 Total snowfall accumulations for Friday are uncertain, but best guess is around 1-2 inches of snow. This is likely to change before Friday as well. 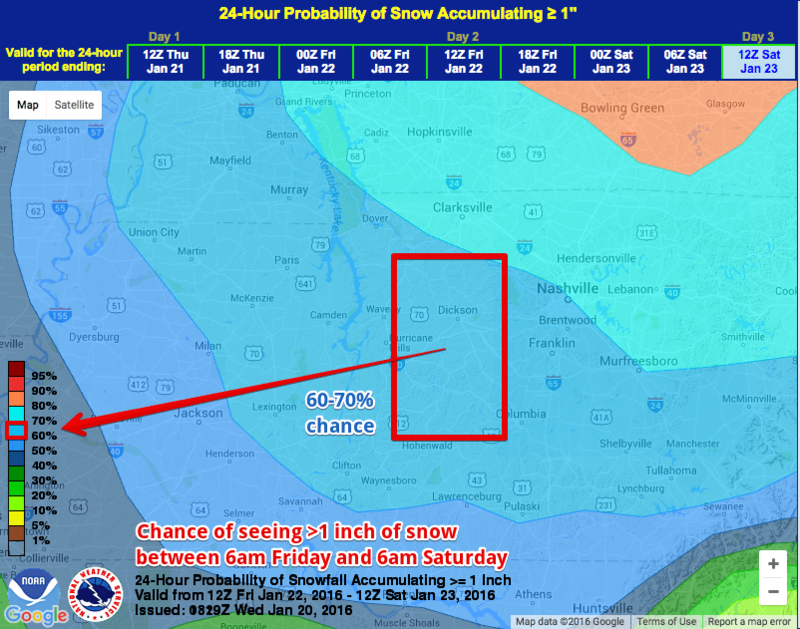 For now, below is the NWS forecasted probabilities of seeing greater than 1 inch and greater than 2 inches of snow respectfully between 6am Friday and 6am Saturday. WORD OF CAUTION: These amounts are just current best guesses and are subject to change. Friday night sees our low temperature fall to 24 degrees with a 50% chance of snow. Winds will be coming out of the north northwest at 15 mph with gusts up to 20 mph. Saturday expect temperatures to rise to only 34 degrees under partly sunny skies. This will help melt anything that we receive on Friday, but it will be a slow melt. Winds will be out of the north northwest at 5 to 10 mph. Saturday night, temperatures will drop to 19 degrees under partly cloudy skies. Winds will calm down.